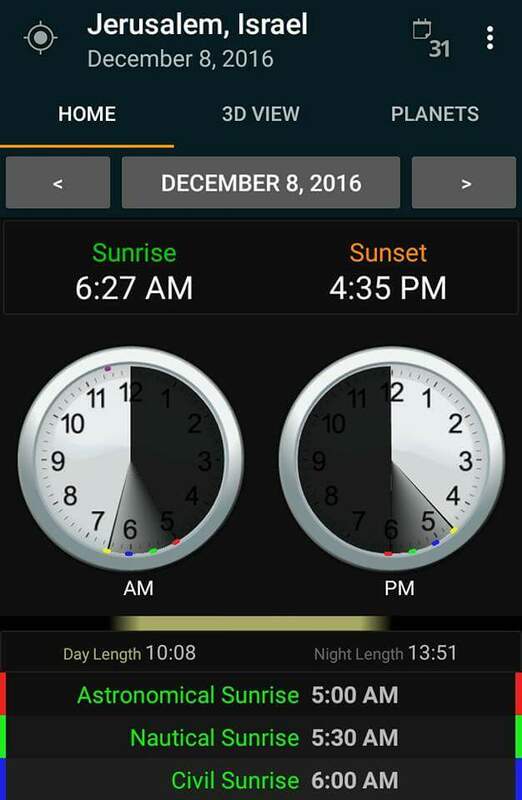 Just after 6:20ish AM on December 8th 2016 (Universal time), there was a vibration or pulse felt on the Earth. In California this happened around 10:20ish PM on December 7th and in Jerusalem this happened on Dec. 8th at the same time (6:20ish am) also. 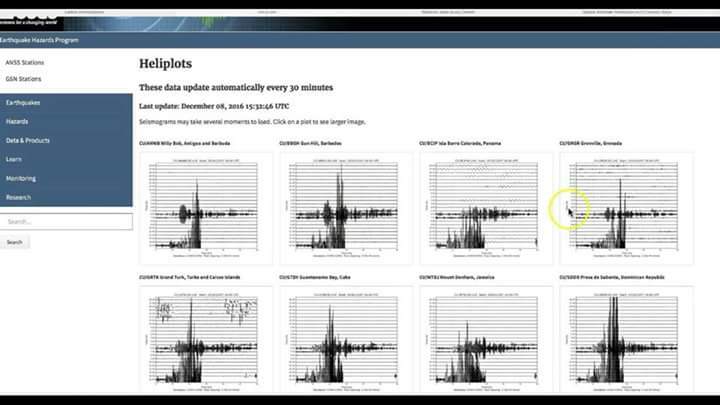 This vibration was picked up on seismology charts made for earthquakes. The only problem with that, that there were no know earthquakes at the time anywhere. The next morning, two earthquakes were felt 100 miles off of the West coast (8.0) and the other off of the coast line near Northern California (6.8). 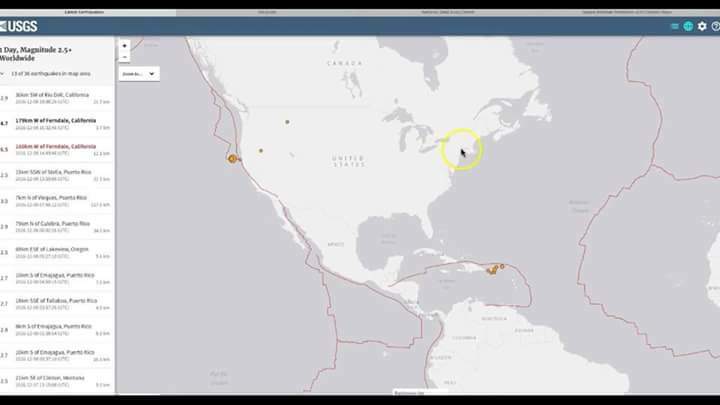 I don’t have a problem thinking that that these two earthquakes were caused by HAARP and/or CERN, but it’s hard for me to believe that this was the case with this vibration that was felt all around the world at the same time. And in some places, this vibration lasted an hour. I can’t stress enough, there were no earthquakes, there was not one that happened during this hour of “vibration”. My first initial thought was that this was the Saturn vibration that I have talked about before. I’m not going to get into it now but you can go through my posts and see where I mention Saturn and this vibration. My next thought was the Pulse ecumenical event that took place a few months ago along with the Pulse nightclub false flag. I personally believe that things have changed spiritually with some sort of “shifting” taken place since April 19th, 2016. This was the date when the Arch of Triumph was set up for the first time and something has definitely happened since then. Not to mention, I have connected both of these Pulse events to this Arch in my studies. I believe that this Pulse is symbolic for giving something life or regenerating something. Kind of like how a heartbeat works hand in hand with a pulse. No pulse no heartbeat. So is something spiritually happening with this December 8th event? It makes me think of the Rev 12 signs in the Heavens event that happens on September 23, 2017. The question is this, is this the beginning of the sign or the end of it? I’m guessing the end of it but let me say this..It’s a false sign. This sign is no good. The original sign and the first time it happened was at the birth of Jesus on 9/11/03 BC. This 2017 event is a false sign ushering in something wicked. So if this is the ending of this sign on 9/23/17 and the time of when it closes, is it safe to say that the symbolism of something being born (by the woman giving birth) needs to start around this time period (December 7, 8, 9, 10)? Now here is where it gets strange. The Roman Catholic Church celebrates the Feast of the Immaculate Conception on guess what date? You guessed it…December 8th. Its the same day every year. Now for Jesus to be born on 9/11/3 BC then the date of the conception is really close. The problem is that the RCC says Jesus was born on Dec. 25th. This means Mary’s pregnancy was actually only 17 days long (which would be the super miracle) or she carried Him for a full year, 12 months (which doesn’t seem at all realistic). So the “church” may have gotten Mary’s conception right but still miss the mark on His actual birth. Not surprising. So it was all about Mary on 12/8/16. Now it’s all making sense right. Because in Roman Catholic reality they actually worship “Mary” over Jesus and of course she is the immaculate conception in their eyes. 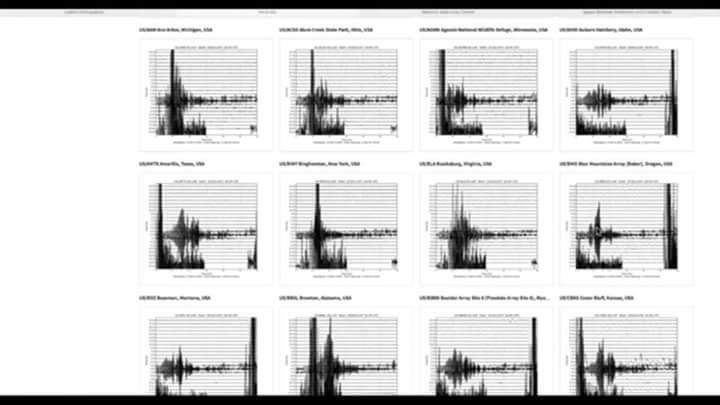 So basically this pulse/vibration happened the same day Mary was conceived. And there Mary is actually Isis from the Osiris/Horus nonsense. Another interesting thing about the timing of this is that it happened around sunrise on the Dec. 8th in Jerusalem. I’ll let you find the significance in that. Was something being birthed spiritually or physically? 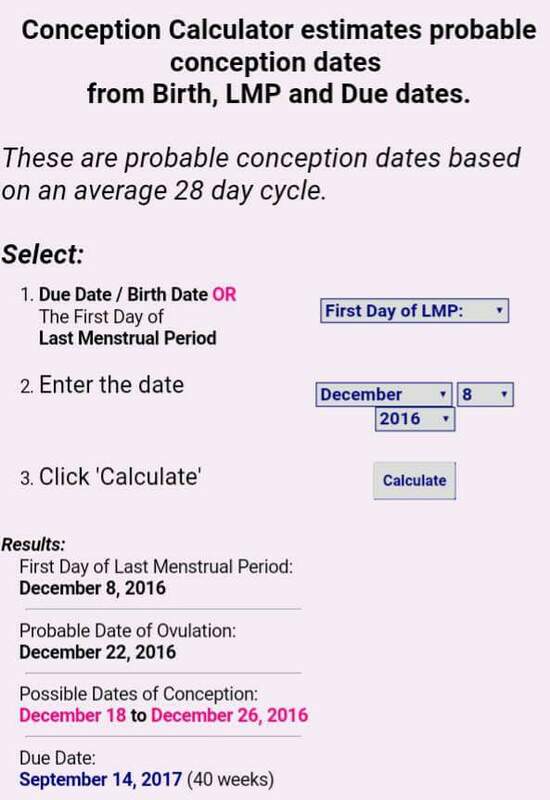 So we can see if a “conception” happens around this time (12/8/16) and it goes through the full term of 40 weeks, this brings us to around 9/14/17. This is 7 days before Rosh Hashana, when the new year starts and 9 days before the Rev. 12 event. I bring all of this up because Jesus talks about that prior to the great tribulation period, it’s like a woman being in travail and going through birth pangs. You can see what this alludes to in Matthew 24. 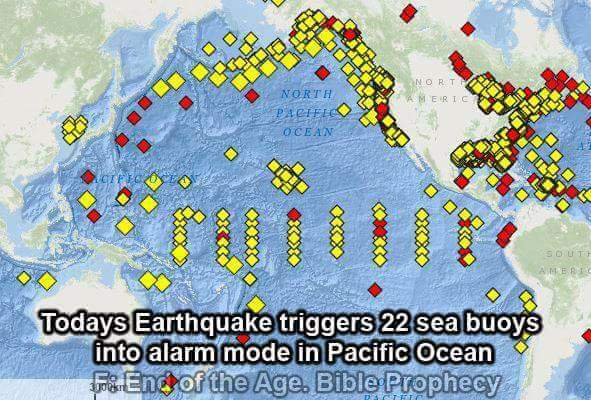 These birth pangs or sorrows are started with wars, rumors of wars, “For nation shall rise against nation, and kingdom against kingdom: and there shall be famines, and pestilences, and earthquakes, in divers places.” (Matthew 24:7) You can be sure to see this happening more often if this timing is right. And remember, 40 is the number for judgement. Is this time period a time of judgement? Now check this out. The Greek word for birth pangs is ōdin (ὠδίν). Odin is actually a Norse name for Nimrod/Osiris/Apollo (Abbadon). Odin means “possessed or mad” and represents Wednesday (Day of Mercury). You can find my research on Asgard to find out more about him. It’s interesting that these pangs or sorrows are related to the word Odin isn’t it? 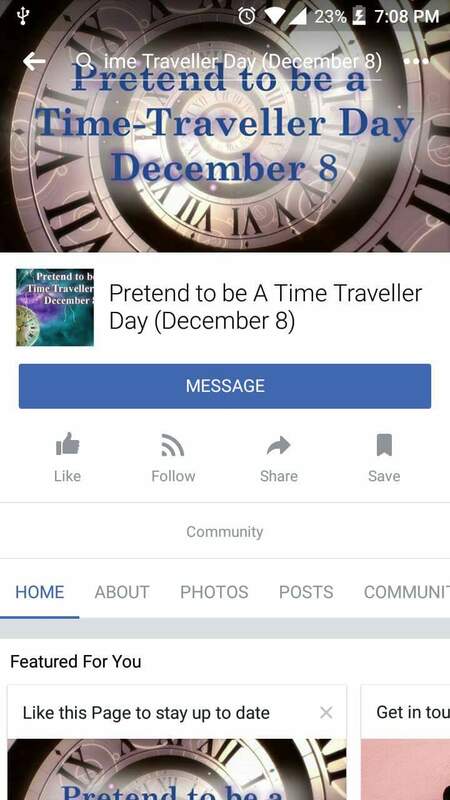 December 8th also happens to be “Pretend to be a Time Traveler Day”. That’s a strange thing to celebrate now isn’t it. (https://geekusa.wordpress.com/2007/12/04/act-like-a-time-traveller-day/) I do want to add that I had read that there were two spirals that formed on the night of Dec 7th. I can’t find the source now so you can take that as you want. We will just wait and see if what happened on Dec 8th has any bearing on it. Only time will tell. One last thing I want to add to this is the position of Saturn at 6:20ish am at sunrise in Jerusalem. The Sun was obviously coming up in the East but it was right next to Saturn. These two were both rising together and were in the middle of the legs of Ophiuchus. 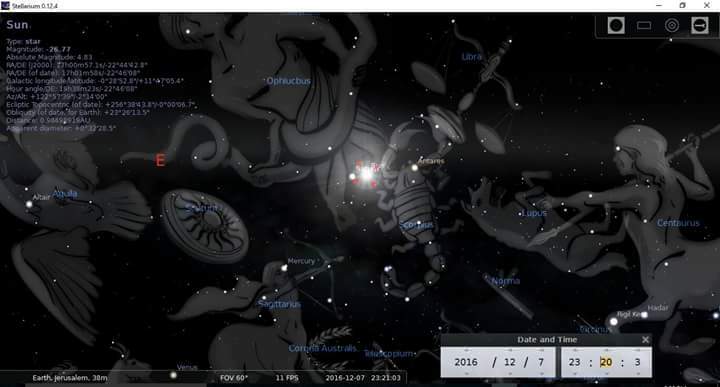 You can see the significance to Ophiuchus on this page also. He is also called the restrainer, so think about that for a second. Also notice in the pic I posted that Mercury is in the left eye of Sagittarius. Sagittarius is the 9th sign that represents fire, it is a centaur (half human, half horse) hybrid and is called the archer. “Sagittarius, half human and half horse, is the centaur of mythology, the learned healer whose higher intelligence forms a bridge between Earth and Heaven. Also known as the Archer, Sagittarius is represented by the symbol of a bow and arrow.” (https://en.m.wikipedia.org/wiki/Sagittarius_(astrology) So you got Mercury who is Odin (Nimrod) in the left eye of the archer (Nimrod) bridging the gap in between heaven and earth, while Saturn and The Sun set in between the legs of the Restrainer. Interesting huh? Now in November of 2017, Saturn will finally leave Ophiuchus after being restrained there for just over a year. This is a few months after the Rev. 12 event. The question I have always had about the great tribulation being compared to a woman in travail is this. What is being birthed? Is it taking about Jesus second coming? Is it taking about something that is being released in the earth? Maybe say like the restraint being taken away from Satan who will be let out for a short time from the abyss so that he can indwell the man of sin? Is it related to the locusts coming out of the abyss who have a king over them called Abbaddon ie Apollo (Nimrod)? Is any of this related to Rev. 12? Yet another connection to March 25th’s Venus inferior conjunction.